These wonderful handmade finds were hand selected with Mothers in mind! 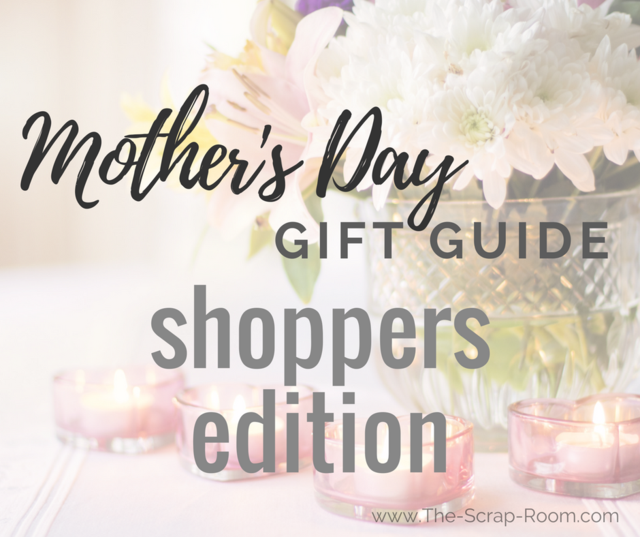 This "Shopper's Edition" of our Mother's Day Gift Guide is filled with handmade items you can order for the special Mom(s) in your life. If you're looking to DIY a special keepsake, check out the Makers Edition of our Mother's Day Gift Guide here! 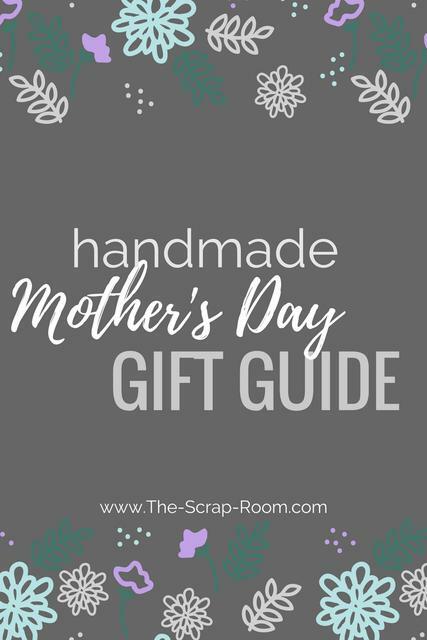 With handmade creations from the US as well as across the pond, and even some digital downloads, you're sure to find something amazing for the Mom(s) in your life, no matter where she lives! If you know of something amazing that I've missed for this round up, and you think that it's a perfect "Mom" find, I'd really love to hear about it -- Share it with me in the comments at the bottom of this page! Mom's are pretty dang special! Which is why they totally deserve a special day, just in their honor, that we can dote on them (a little extra -- because hopefully we're doting on them on a regular basis too!) ;) In the United States, this day is always the 2nd Sunday in May. For our friends in the UK it's linked to Easter, so it falls a couple months earlier. (I'm sorry UK friends that this post is coming out a little late for your 2018 Mother's Day! 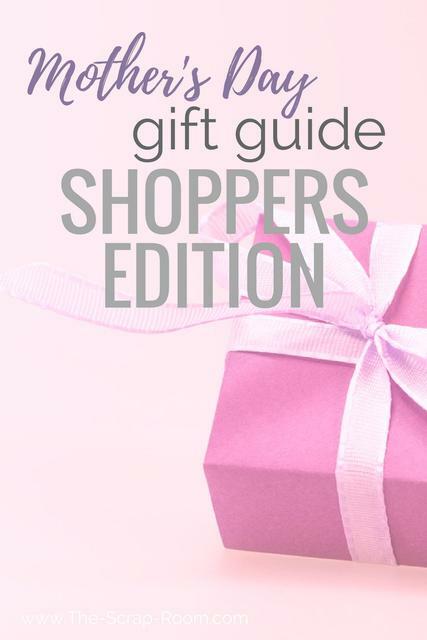 The good news is though that many of these gifts are great for moms year-round, so be sure to keep reading! I'd be willing to bet you'll have other reasons to celebrate Mum this year!) ;) Here's a great article on The Sun's website about why we celebrate on different days. If you are among those who are lucky enough to get to spend the day with your Mom, that's awesome! You're super lucky and I've got to admit, I'm jealous! <3 My mom is on the other side of the country from where I live and I usually have to settle with a phone call, and mailed gift. But sometimes it can be hard to find just the "right gift", so I put together a collection of some of my favorite handmade finds by some amazing artists, and I think you're really going to enjoy it! I hope this page helps you find something a little extra special for the mom or moms in your life! Remember to bookmark or Pin this page for later -- Many of the Mom gifts shown here are appropriate for other holidays as well. If your Mum lives across the pond, be sure to catch the "In the UK" section a little further down the page, or click here to skip to it! If you enjoyed this page or found value in it, please share it on social media! Disclaimer: Please note that this post may contain affiliate links. There is no additional cost to you, but The Scrap Room may earn a small commission should you choose to purchase through those links. Read my full disclaimer here. Thank you for your support. 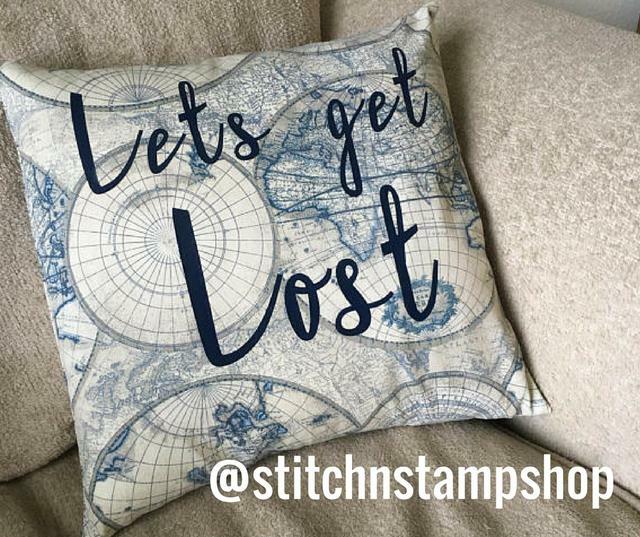 When I saw these Wanderlust pillow cases, made by Ashlee at Stitch N Stamp Shop, I knew I would be including them in my list! I mean, what mom doesn't need a handmade piece of decor that not only looks beautiful displayed in their home (traveling or stationary!) but is useful as well? Ashlee also takes custom orders so you can have one designed and created especially for your mom! I especially love that since they are pillow cases, Mom can change them out with little-to-no effort. So if you really want to spoil her, order a few for different seasons or different holidays, that she can swap out throughout the year! My Mom likes to travel, and always brings a small pillow for long drives so this would be perfect for her at home or away! Ashlee also makes handmade greeting cards and, like I mentioned, welcomes custom orders, so if you'd like to work with an artist to commission something special for Mom this year, she's definitely someone I'd recommend you get in touch with! You can check out more of her work on her Instagram page here. Does your mom like warm hugs? 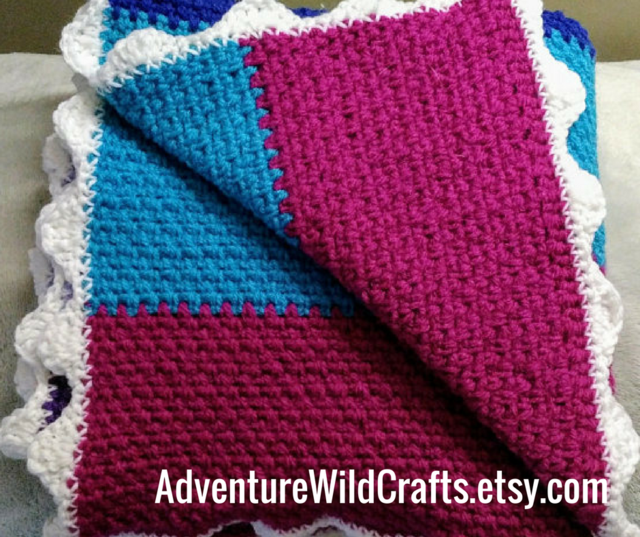 These handmade knitted and crocheted gifts from Adventure Wild Crafts may be the next best thing, and will wrap your mom with warmth and love! All the items in this shop are created with the outdoor enthusiast in mind and are handmade by Sarah (the shop owner) and fellow artisan Trudy, from TrudesignsCrafts. 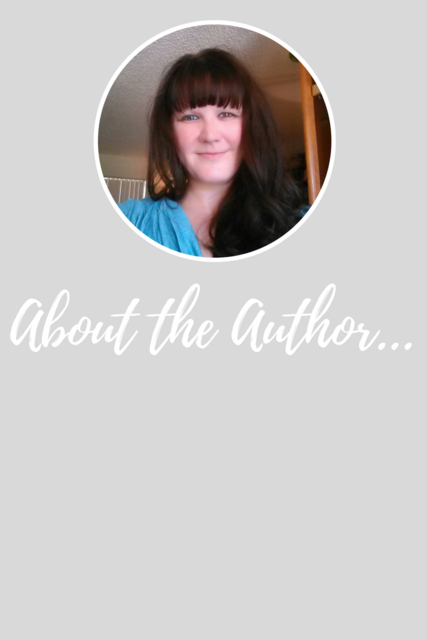 Sarah has been crafting for years and can not only crochet, but designs hand-sewn travel journals, printed T's and other outdoor items as well. She also takes custom requests, so if there's something in particular you'd like her to make, don't hesitate to send her a message and ask! Her friend Trudy, rounds out the collection with her expert knitting skills, and together they are able to offer a variety of quality, handmade items such as lap blankets, ear warmers, and fingerless mitts. She even sells warm hugs for mugs! Seriously! How. Stinkin'. Cute. are these Mug Hugs?!?! Stop by Sarah's shop here or visit her website -- it's a wonderful resource if you're looking to connect further with nature! 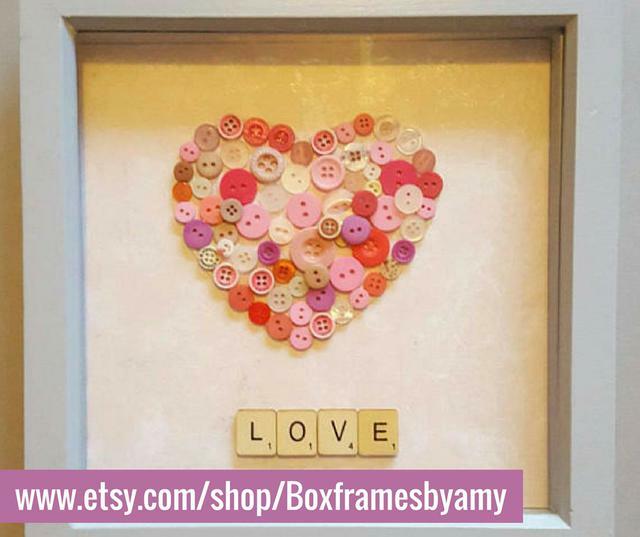 Amy, from Box Frames by Amy, makes lovely framed art that any mother would be honored to receive and display in her home! I'm kind of obsessed with wooden tile letters so I LOVE that she uses them in many of her pieces. She also has other beautiful designs though, like this 9 Heart display or this single heart design with glitter and scatter beads, and can make something special for just about any occasion. One of her latest creations is this button heart design made especially for Mom. I simply love the quote she used on it! Couldn't be more true! But I think if I had to pick a favorite, it'd have to be this Family Tree framed art. I'm super into genealogy, so I love anything that has to do with family history! Visit Amy's Etsy shop here and browse her designs, and don't forget to follow her on Instagram to see all of her latest art! Kate from ClikaTies makes these amazing, head-turning statement necklaces. 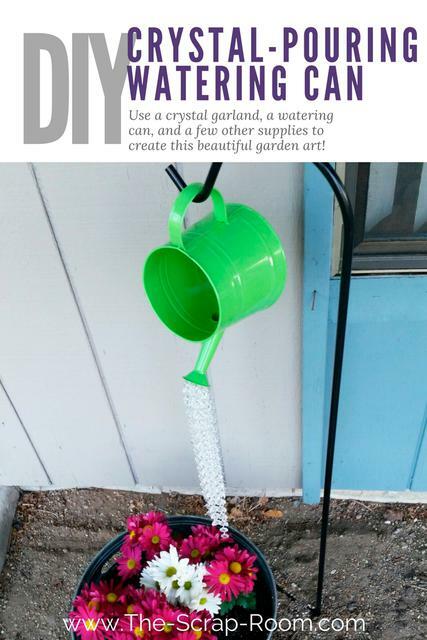 I love everything about this innovative accessory! Besides being incredibly lightweight, another great feature about this necklace is it's actual design. No difficult fasteners, the Clika can slide up and down to be positioned differently on the ClikaTie, and the pendants are completely interchangeable! Purchase the base necklace by itself, or with a pendant, and then if you decide to buy her more pendants down the road (or she wants to splurge herself) they'll all work on the same necklace! Although Kate is actually based in the UK, she does ship to the US -- but please be aware that shipping may take a little longer if you're ordering for delivery in the US. 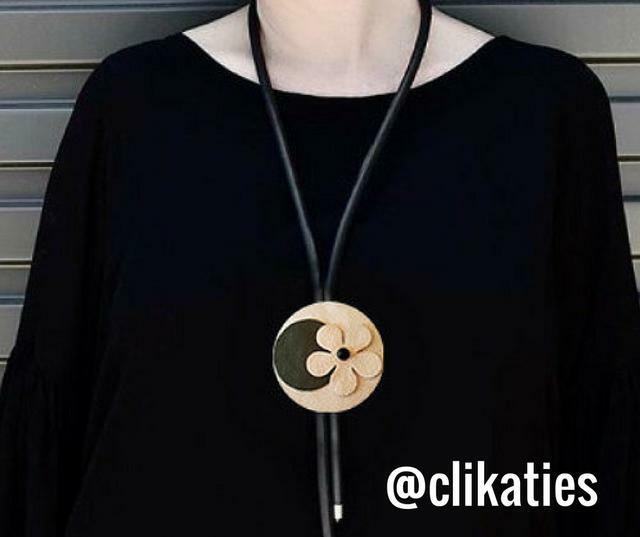 Follow ClikaTies on Instagram for more pictures of these striking statement pieces, and for styling inspiration or visit her Etsy store to shop her collection. Thinking of sending a floral arrangement for Mother's Day, but wish it would last a little longer? 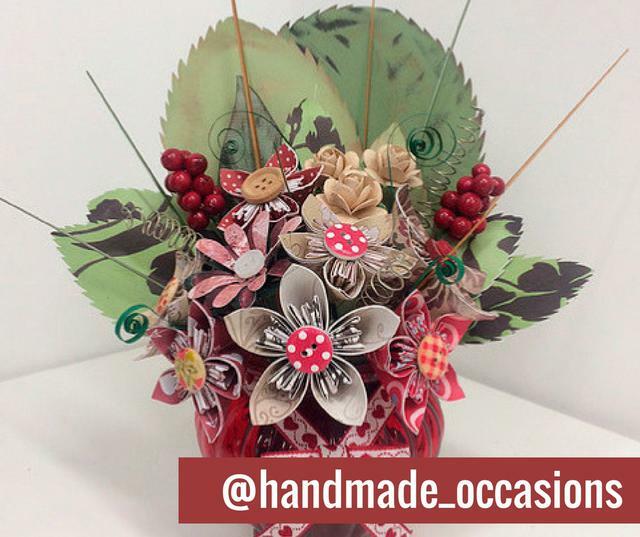 Check out these impressive paper arrangements made by Ria from Handmade Occasions! She designs bouquets and arrangements for all kinds of occasions but she created this one, shown above, specifically for Mother's Day. It's available in her online shop here -- you can even order one in your choice of colors! Hop over to Ria's website and check out more of her designs by clicking here. You'll be absolutely blown away by her work! Does your Mum love chocolate? (Nevermind...silly question!) 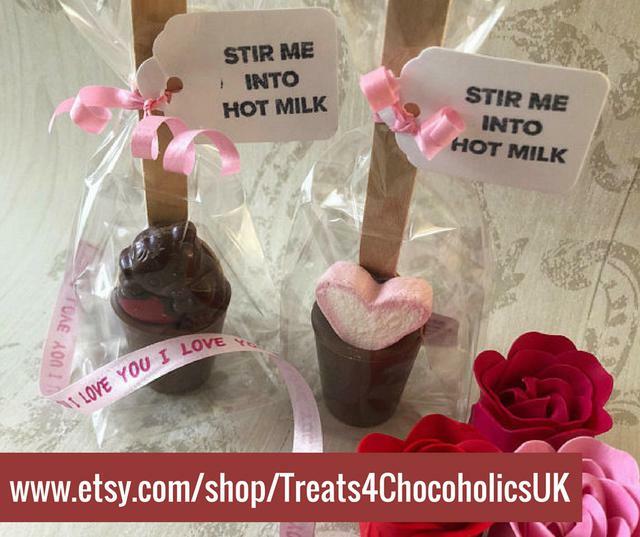 Elisa from Treats4ChocoholicsUK makes so many wonderfully delicious treats, but these adorable stir sticks are just too cute! They're even available with two different toppings so you can choose which you think Mum will best -- or buy her both! What a fun and decadent treat for a special occasion! Simply stir in a warm glass of milk and enjoy. For all the latest from Treats4Chocoholics, be sure to follow her on Facebook here. 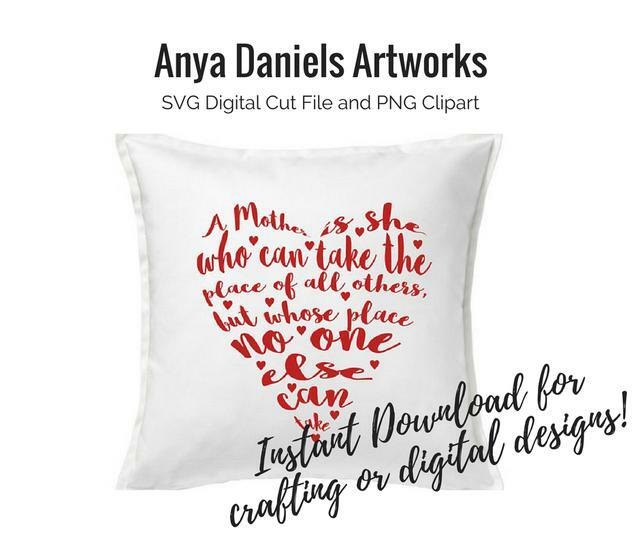 Anya from Anya Daniels Artworks creates digital art and created this lovely design just with moms in mind! Her listing includes high quality SVG and PNG formats (Click here or click the "Digital" tab in the top menu bar to learn more about working with digital files) so basically that means you can use this super versatile file set to create almost anything!!! You can even use the files to make a printable for Mom, right at home! 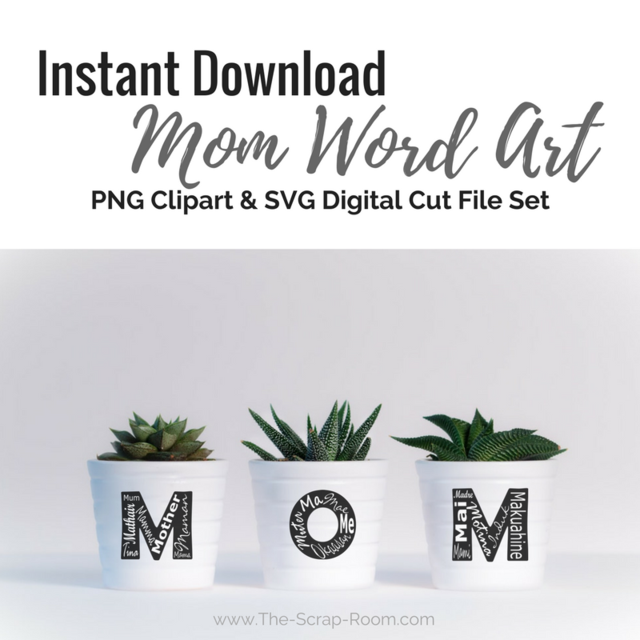 The SVG file is perfect to use on your compatible electronic cutting machine, like a Cricut or Silhouette, and with it you can create all kinds of handmade projects for Mom! Decorative pillows, wooden signs, paper crafts... The sky is the limit, really! You can even use SVG files in many digital design programs. Anya's set also includes a PNG version which can be used in just about any editing program to create printable wall art, decorate digital photographs, make greeting cards, create scrapbooking printables and more! Learn more about this instant download in her Etsy shop here! To see all of Anya's latest creations, follow her on Instagram here! In addition to selling ready-made pieces, Kerry also creates custom stained glass art. A few of my favorites that she's made include a unicorn, a precious angel, and this one-of-a-kind caravan. If you haven't already, be sure to stop by her Facebook page, and see more of her beautiful creations! 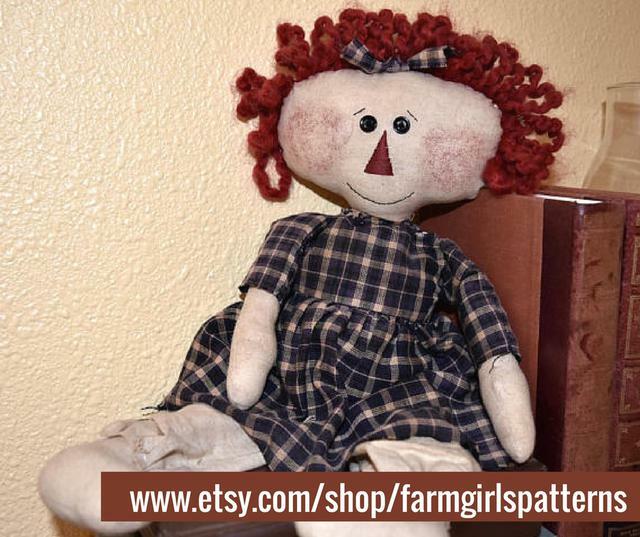 Cherryl from Farm Girls Patterns in Billings, Montana makes some of the most lovely Primitive home decor! If your mom likes rustic, farmhouse or primitive art as much as mine does, she'll probably love anything you pick out from Cherryl's shop! I've only shared one pic on this page, but she sells a variety of beautiful items, so be sure to stop by her Etsy shop and check them out! She also sells some digital prints that can be printed at home and framed. Keep up with all of Cherry's latest projects by following her on Instagram here! Here's a couple of goodies I KNOW you're going to want -- and probably not just for Mother's Day! 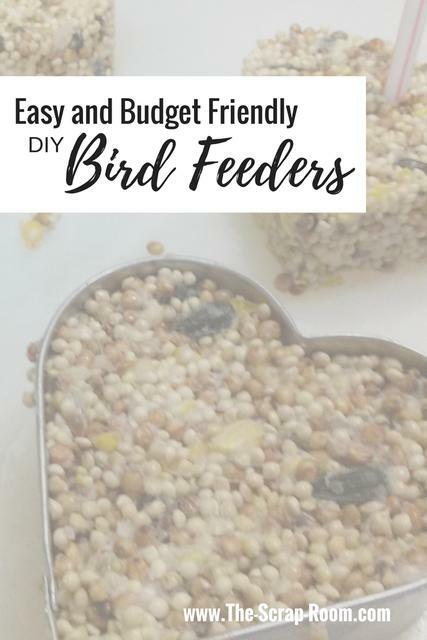 I've gone ahead and embedded the pins above so they are super easy for you to save! These "love" printables were designed by Mary at joywithpurpose.com and she is kind enough to be giving them away absolutely FREE on her website! 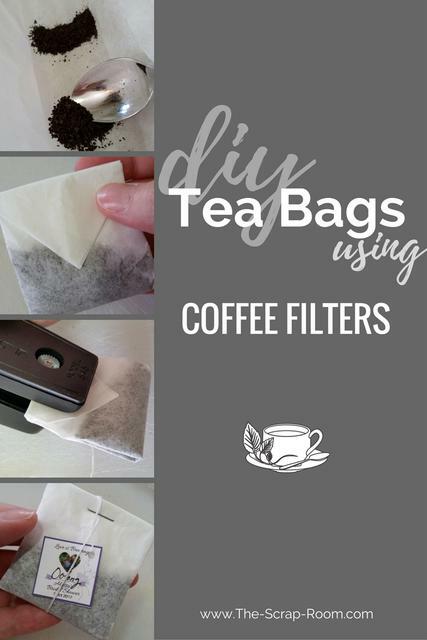 Mary also has a lot of other really great printables and craft tutorials on her website. I definitely recommend bookmarking her page and following her on social media! She's on Facebook, Pinterest, and Twitter just to name a few! 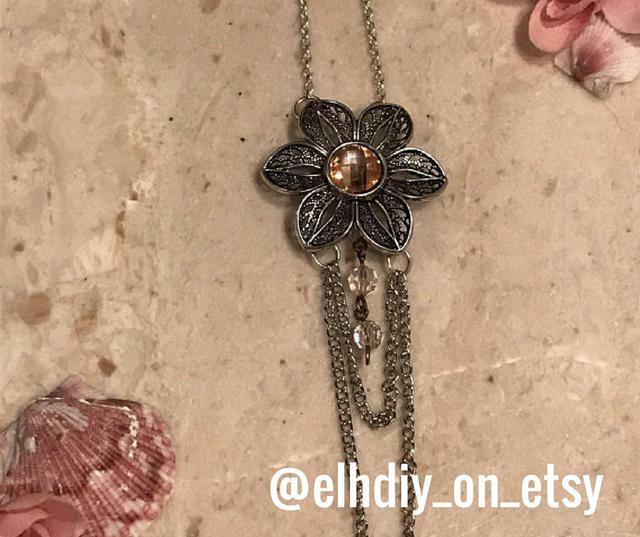 Emily at ELHDIY makes stunning handmade jewelry (as well as key chains and string art!) She has a great eye for design and puts together some absolutely beautiful beaded pieces! If your mother likes to accessorize (and really, what woman doesn't?!) Emily's Etsy shop is definitely worth checking out! You can also order custom string art in Emily's shop. She makes these really cool State String Art displays, and can create a custom design just for your mom -- you pick the colors and state/city! Let her help you create something fun to commemorate a favorite place, such as Mom's home, or yours, or a favorite travel spot that is special to you both! She can even create animal, emoji, and other designs, so if there's something in particular you're looking for, don't hesitate to ask! To see more of Emily's work be sure to follower her on Instagram here! This "Mom" graphic is something that I designed especially for this Mother's Day post. I really wanted to create something fun, that could be used in a variety of ways, that really says "Mom". And this certainly does! In fact it says "Mom" in 18 different ways! 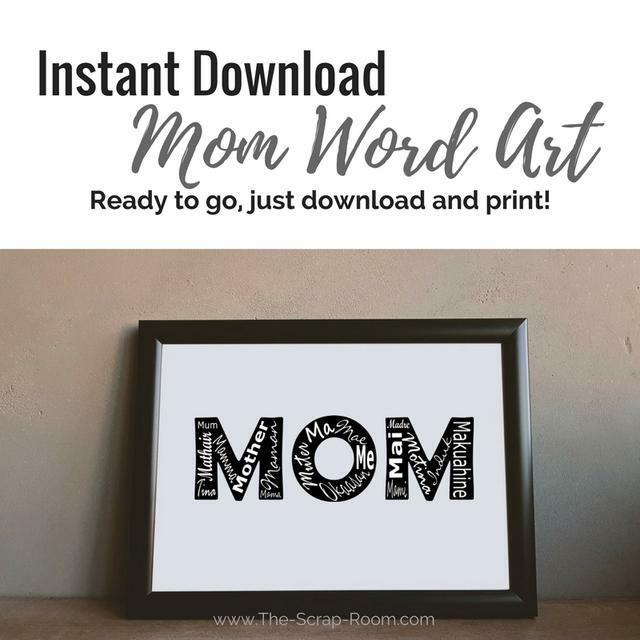 The printable edition comes with both a 12"x 12" square version as well as a 8.5"x11" rectangular design so that you can print it out at home and put it in the frame of your choice to share with mom. You can order it here and download it right away. Print it out at home or order a print from your favorite print shop, frame, and give to your mother! It's also available in PNG and SVG formats. If you want to print it larger than 12"x 12", use the graphic in your digital designs, or cut it out on your SVG compatible cutting machine, click here to check out the Digital Graphics set for this design. Hi! I'm Lindsay! I've been crafting and scrapbooking for over 2 decades and love sharing about projects with my readers! Click here for my full bio. The above handmade Mother's Day gifts are great if your mom lives in the United States, but if she's across the pond, finding an artisan who's a little more "local" might be helpful if you're looking to order something handmade for her this holiday and have it shipped direct. Below is a collection of some of my favorite finds in the UK. Mother's Day may be a couple months before the day we celebrate in the US, but really, are there ever too many reasons to celebrate someone so special? Keep reading and find something beautifully handmade for your mother's next birthday, holiday, or special occasion! 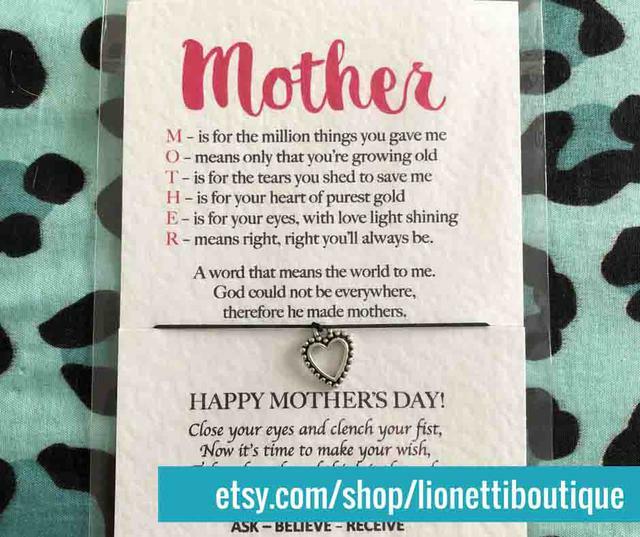 She welcomes custom orders and can really create something unique for your mom. And I'm not just talking color and fragrance choices. I've seen some of Ashley's creations made with fun glasses that look good enough to drink (though I'm sure that's not recommended!) 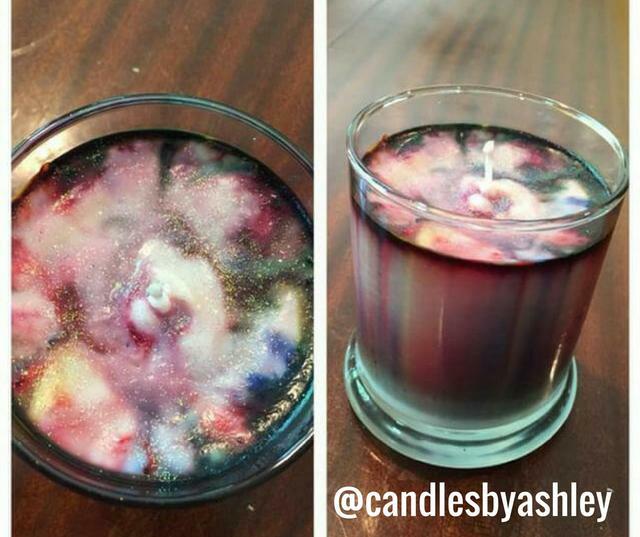 ;) like this fun strawberry mocha candle. Follow her on Instagram here to see all her latest creations and contact her about creating something special for your mom this holiday! ​PS -- Did you even know there was such a thing as Shimmering Gel Wax?! Check out this short video if you want to be mesmerized! You can get this design as a photo frame for Facebook -- absolutely free! Just click below to add it to a photo of Mom and share it with your family and friends! I really enjoyed putting this Mother's Day Gift Guide together, and hope it really helps you find something unique for your mom this year. Handmade gifts are always so special! If you know of something amazing that's handmade and "Mom" inspired that you think I've missed, please tell me about it in the comments below! How pretty are these wish bracelets from Lionetti Boutique?! They come on beautifully printed cards to match the occasion and even though this shop is located in Wycombe, they do ship to the US -- just make sure you allow enough time for delivery. The shipping time is usually only about a week. This shop is run by duo Elisa and Sean, who hope to run more quirky gift shops in the future and share their fun finds full-time. You can read their story here. Spoiler alert: Elisa also makes amazing chocolates! 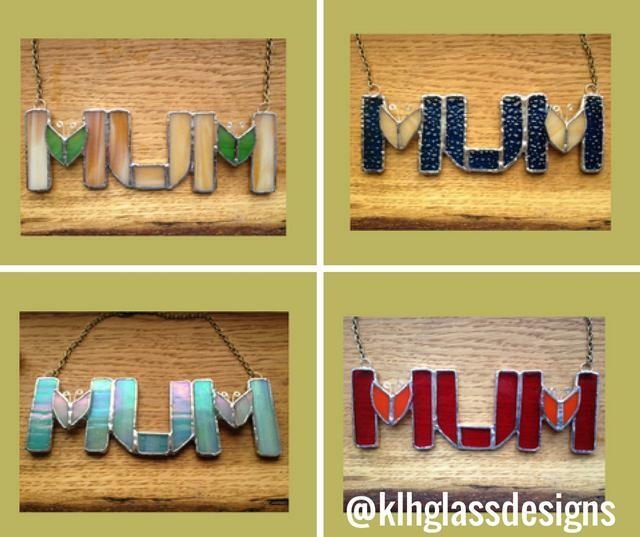 They do custom orders too, so swing by their shop and order something personalized especially for your mom!